Spray Polyurethane Foam or SPF roofing is excellent for restoring your current roof or as a new construction project. The foam used in these systems must be coated with a roof coating in order to provide the SPF roof with adequate protection needed from deterioration caused by the sun’s Ultra Violet (UV) radiation and water infiltration. Acrylic roof coatings are among the most popular in the roofing industry for protecting SPF because of their strength and ability to adhere to the spray foam. These coatings have a long history of success (check out our SPF Case Histories), high quality ingredients, and fire retardants that work together to construct a seamless, durable, and flexible membrane with excellent resistance to UV destruction and water penetration. When you combine SPF roofing with an acrylic roof coating system, you gain the strength and protection needed for the roof to function properly, as well as, excellent insulation, custom slope and superior reflectivity. These systems provide customizable levels of insulation to reduce heat loss and gain to the building, allowing your building to remain a consistent indoor temperature with less need to heat or cool the building. Custom slope can be created with the spray polyurethane foam for improved proper water drainage and ponded water protection. High solar reflectance and thermal emittance properties gained from the acrylic roof coatings ability to reflect the sun’s heat away from the rooftop, lowers energy cooling costs and contributes to the reduction of heat transfer to the inside of the building, allowing the building to remain cooler on a hot day. National Coatings has several SPF roofing systems coupled with acrylic roof coatings to provide all the benefits mentioned above. With over 33 years of proven performance, the AcryShield SPF Roofing Systems can decrease your energy consumption and costs. This is a huge reduction in cost based off California’s energy-efficiency movement - Flex Your Power© which states “A 30% reduction in energy consumption can lower operating costs by $25,000 a year for every 50,000 square feet of office space.” If you are interested in more information on SPF Roofing or the Benefits of Coating an SPF Roof, download our FREE Guide. 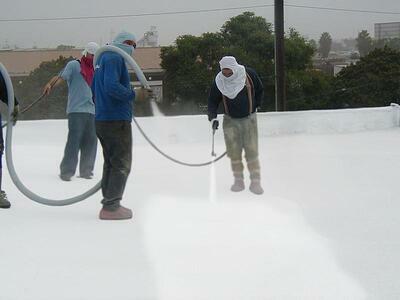 What's the Recommended Skill Level for Installation of Roof Coating Products? National Coatings is a roof coating manufacturer that creates and provides roof coating products to the roofing industry. We do not employ our own roof coating contractors but we do offer an Approved Applicator Program to provide our customers with a list of roof coating contractors that have met and/or exceeded our expectations and criteria. We not only highly recommend using one of our approved applicators for your next roofing project but if you are interested in obtaining one of our 10, 15 or 20 year roof warranties, we require you to use one of our approved applicators. Possess strong monetary constancy and outlook. Have and retain an excellent reputation among contractors, building owners and suppliers. Exhibit a strong history of high quality applications of the same or similar type materials to roof coatings. Required to have a current roofing contractor license. Membership in a recognized roofing organization such as: NRCA, Western States, RCA etc. Once we have determined the contractor meets the above criteria, we feel fully confident in the ability and willingness for that person to dependably install our roof coating products and systems to our standards. National Coatings fully supports our approved applicators who have gained our trust and who have already had a longstanding, excellent reputation in the roofing industry due to their high quality of workmanship, standards and dependability. With all that said, National Coatings highly recommends using an approved applicator for the installation of our roof coating products. If you would like information on becoming an approved applicator, fill out our form or if you are a building owner/facility maintenance manager, contact us for an approved applicator in your area 800-423-9557.